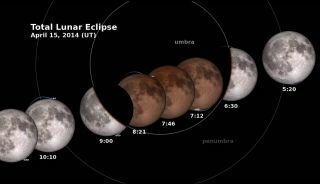 Fancy a lunar eclipse? Skywatchers in the United States have the chance to see four total eclipses in the next 18 months, beginning with a "blood moon" on Tuesday (April 15), just in time for Tax Day. The moon events will begin with the total lunar eclipse of April 15, which will be visible across North America (weather permitting) starting around 2 a.m. EDT (0500 GMT). The moon will shine red when the total eclipse happens, which will occur for about 78 minutes around 3 a.m. EDT (0600 GMT). "The most unique thing about the 2014-2015 tetrad is that all of them are visible for all or parts of the USA," Fred Espenak, a NASA astrophysicist and eclipse specialist, said in a statement. Tuesday's total lunar eclipse, for example, will be visible from most of North America, as well as parts of South America and Alaska. Last week, rumors swirled online suggesting a link between the total lunar eclipse tetrad and biblical prophesies of the apocalypse because it would bring about "four blood moons." The theory was published in a book entitled "Four Blood Moons" by John Hagee in 2013. But tetrads of moon eclipses are not super-rare, in Espenak's view. "During the 21st century, there are nine sets of tetrads, so I would describe tetrads as a frequent occurrence in the current pattern of lunar eclipses," Espenak said. "But this has not always been the case. During the 300-year interval from 1600 to 1900, for instance, there were no tetrads at all." As for the why the moon turns red during the eclipse, this is because it reflects sunsets and sunrises happening all around the world as the sun shines through the Earth's atmosphere. This can turn the moon a dusky red color, sometimes even resembling the color of blood. Lunar eclipses occur during full moons, when the moon passes behind the Earth, with respect to the sun. The alignment can either completely obscure the moon with Earth's shadow (a total lunar eclipse), or partly covers the moon (a partial eclipse). Because the moon's orbit is tilted, it does not align perfectly every month, lunar eclipses typically occur about twice a year, but they usually come in different flavors. For example, a total eclipse could be followed by a partial eclipse, and then followed by a penumbral eclipse — an event in which the moon just skirts through the outer edge of Earth's shadow. And remember this if you venture outside early Tuesday to gaze at the moon: You may have to pay taxes on April 15, but seeing the total lunar eclipse is free. You only have to look up. Editor's Note: If you snap an amazing picture of the April 15 total lunar eclipse, you can send photos, comments and your name and location to managing editor Tariq Malik at spacephotos@space.com.